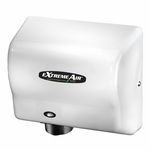 Bobrick B-264 Single Roll Toilet Tissue Dispenser with Controlled Delivery. Bright-polished, chrome-plated steel. Vandal-resistant, self-locking mechanism. Controlled delivery; toilet tissue roll will not spin freely; eliminates waste. Accommodates one standard-core toilet tissue roll up to 4-1/2" (115mm) dia.. Roll cannot be removed from dispenser until empty.